The situation of the Jews in France and England deteriorated so rapidly during the 1200s that Ashkenazic Jewry stood on the verge of both physical and spiritual extinction. Almost all of the copies of the Talmud and related manuscripts upon which the academies of France and England depended had been either confiscated or destroyed. As a result, the study of Torah naturally diminished. Historically, it would have disappeared except for the efforts of three men. Indeed, in the history of the Jewish people it is almost always a few, select individuals who single-handedly turn an otherwise hopeless situation around. Of course, the success of their efforts is due to God’s promise regarding the eternity of the Jewish people. That is what gives the individual the ability to achieve almost superhuman results. The three men are a teacher, his disciple and the disciple’s disciple. The teacher is Rabbi Isaac the son of Moses from Vienna. He was born in about 1200 and died in 1273. He is often referred to as “the Ohr Zerua” after the book he authored. Besides his scholarly achievements, he gained renown as the first paid rabbi. It is an indication, he himself writes, of the troubles of the times that they could no longer continue the custom where the rabbi supported himself. 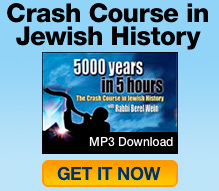 Until his day the rabbi was self-sufficient; he somehow had his own means of support and served as a rabbi gratis. This probably still is the ideal situation, because it insulates the rabbi from many of the pressures that must of necessity accrue when he has to make decisions regarding the people paying him. However, now the economic pressures upon the Jews were so intense and fierce that there was no way for people to have a half-day business. The earlier rabbis always had a business on the side. That type of situation no longer existed. From Rabbi Isaac’s time onward, up and including our time, the Rabbinate has been a profession for which the community paid. After traveling throughout France and Germany, Rabbi Isaac finally settled in Vienna, where he was born. Although Jews faced terrible persecution, he found favor in the eyes of the Emperor of Bohemia and under his protection was able to establish a sizable and strong Jewish community in Vienna. In Jewish history, there seems to have always been pockets that were somehow protected from the worst sufferings. Vienna under Rabbi Isaac was one such place. In Ohr Zarua he codifies Jewish law. He tried to do what Maimonides tried to do, but in a much more concise fashion. Implicit in the Ohr Zarua is that the book is all you need. They can burn the Talmud, but as long as this book exists you can preserve everything until the time when the books and academies can be restored. Ohr Zarua has to be seen as the bridge that carried the Jews over that terrible chasm when their books and academies were destroyed. They were on the verge of receding into a Jewish Dark Ages, but the Ohr Zarua helped avert that. Rabbi Isaac’s main disciple was Rabbi Meir ben Baruch, the Maharam of Rothenburg. Born in 1225 into a very distinguished, rabbinic and scholarly family he died in 1293. He is one of the editors of Tosafos commentary found in the Talmud today. All European Jewry addressed their questions to him. We have close to 3,500 legal responses of his. It is just enormous. In short, he took an object of shame and made it an object of pride. Stick to your guns and do it in a way that it preserves Jewish tradition. The underlying reason behind this and other decisions is that one has to be proud to be a Jew. That is the enormous genius of his response. The thing that’s most difficult to obtain and easiest to lose is the pride of being a Jew. If a person is proud of being Jewish, he can obtain everything. It is only people who are overcome with a lack of pride, self-hate, that are always nervous about it. In 1285, the Maharam of Rothenburg left Europe to go to the Land of Israel, which was then under Turkish rule. The leader of the Turks openly solicited Jewish immigration expecting the Jews would build up the country, etc. Simultaneously, the situation in Europe turned even worse for the Jews. They had been kicked out of France and England, and now they had to leave Germany, Austria and Bohemia. The question was where to go. Most opted to go east, and that is the beginning of the large Jewish emigration to Poland, Lithuania and parts of Russia. Some went south. There was a sizable emigration to Spain. Others headed for the Holy Land. The Maharam of Rothenburg was among them. He set out incognito, because it was illegal to leave one’s town, especially Jews. He came to Lombardy in northern Italy, but there he was recognized by a Jew that had converted to Christianity, who turned him over to a local baron. The baron sold him to the Emperor of Austria for a fee. The emperor held him for ransom in one of his castles. However, the Maharam of Rothenburg refused to allow the Jews to ransom him. The emperor started out with a very high ransom 30,000 marks, but at the end he was willing to take almost anything. While incarcerated, Divine intervention allowed the Maharam of Rothenburg to have visitors and even run his academy. He stayed in prison for the last seven years of his life, but never allowed the Jews to ransom him, even though there were numerous offers to do so. He died in 1293 in prison. The emperor then held the body for ransom. But the Maharam had left a will forbidding it. The Maharam had a disciple, Rabbi Asher ben Yechiel, known as the “Rosh.” He represents the culmination of the age of the Baalei Tosafos, and was arguably the greatest of them all, the one who put all their works in order. He wrote a commentary on the Talmud that appears in back of every volume that is printed today. Rabbi Asher is the baseline legal opinion of Ashkenazic Jewry. When Rabbi Joseph Karo came centuries later to write the Shulchan Aruch, he said he would take into consideration three opinions: Rabbi Isaac Alfasi (“Rif), Rabbi Moses ben Maimon (Maimonides), and Rabbi Asher ben Yechiel (“Rosh”). Jewish law is built on that three legged stool. The terrible persecutions in France and Germany, forced Rabbi Asher to leave for the city of Toledo, in Spain, and he brought with him a sizable amount of Ashkenazic Jews. By that time, the northern part of Spain had become Christian and the Ashkenazic Jews were used to doing business with the Christians. Rabbi Asher had much more experience with Christians than the Sephardim. The Sephardim misread the Christian reconquest of Spain. They thought that the Christians were like the Muslims they were accustomed to doing business with. They didn’t realize the intensity of the anti-Jewish feeling of the Christians or that many Christians felt that their ticket to the heaven was based upon their hatred to the Jews. That was their road to sainthood and to greater piety. They expected the Christians to treat them the way the Muslims treated them for 300 years. Nothing could be further from the truth. The Christians immediately set out to not only narrow any rights the Jews had but to force them out of positions of influence, including curtailing their rights of education. From the 13th century onward, with few exceptions, there were no more Jewish doctors, poets and diplomats in Spain. It became like France, Germany, England, Austria and Bohemia: a place that was very uncomfortable for Jews. When the Rosh came to Toledo, he brought with him his son, who would become one of the great people of Jewish life and law: Rabbi Jacob ben Asher, author of the Tur, one of the cornerstones of Jewish law. Ironically, this father-and-son combination – this cornerstone of Ashkenazic Jewry — lived in Spain. Rabbi Jacob authored the Tur, meaning “the row.” He codified all of Jewish law into four sections or “rows.” His system of codification became accepted throughout all subsequent the Jewish law. Maimonidies codified Jewish law into 14 different sections, but this series of codifications was too sophisticated to gain wide acceptance. When Rabbi Joseph Karo will write the Shulchan Aruch 200 years later, he based his arrangement on the codification of the Tur. This book, the Tur, together with the writings of Rabbi Asher (the Rosh), the Maharam of Rothenburg and the Ohr Zarua in effect rebuilt all of Ashkenazic Jewry’s knowledge. In 75 years, the situation was completely reversed. Instead of being in danger of extinction, Jewish knowledge was now codified, ordered meticulously and accessible. Consequently, the academies were able to rebuild themselves and the danger of the book burning had passed. That was a remarkable achievement. While Ashkenazic Jews replanted in Spain found temporary haven, Sephardic Jewry now entered into one of the darkest and most brutal epochs in Jewish history. Sephardic Jewry suffered more than the Ashkenazim, because the Ashkenazim at least were accustomed to what Christianity was. For the Sephardim it was a shock that many of them never recovered from. we have sheperdic jews in india, basically from mesopotomia, inter married with local peoples, but there is a genetic /culture similarity with a gp of maharastrian brahmins called konkanista brahmins who originated on the konkan coast south of mumbai/bombay, who appear to be the decendents of askanzi jew sailors ship wrecked on the konkan coast, who intermarried with the local tribals about 1ooo years ago.. I BELONG TO THAT group of peoples and we are blue /green eyed generally fair peoples, I would like to know if there is any truth of our jewish origins,even though we are hindus now?please respond cause I feel a deep affinity for isreal! It is difficult to know exactly but there is no doubt that Jews were in India even a few thousand years ago and intermarried with local people. It may very well be true that your group may have Jewish antecedents. All blessings and good health to you.